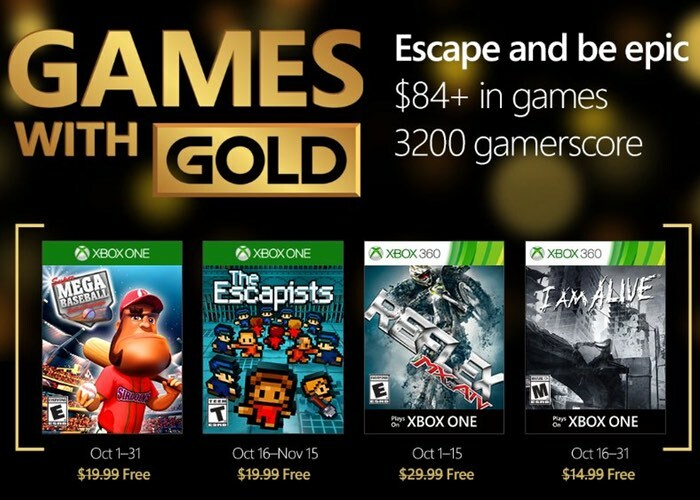 Major Nelson has this week announced the new free games that I can be made available via the Xbox Live Games With Gold service for October 2016 revealing that Xbox one owners will be able to enjoy Super Mega Baseball and The Escapists. While Xbox 360 owners will be able to enjoy MX vs ATV Reflex and I Am Alive later in the month. Check out the promotional video below to learn more about what you can expect from the four new games that will be made available via Xbox Live Games With Gold during October 2016 also available on the Xbox One thanks to Backward Compatibility. On Xbox One, Xbox Live Gold members can download Super Mega Baseball: Extra Innings ($19.99 ERP) for free during the month of October. The Escapists ($19.99 ERP) will be available as a free download from October 16th to November 15th. On Xbox 360, starting Saturday, October 1st, MX vs ATV Reflex ($29.99 ERP) will be free for Xbox Live Gold members through October 15th. Then on October 16th, Xbox Live Gold Members can download I Am Alive ($14.99 ERP) for free through October 31st.